The British National Antarctic Expedition, 1901–04, generally known as the Discovery Expedition, was the first official British exploration of the Antarctic regions since James Clark Ross's voyage sixty years earlier. Organised on a large scale under a joint committee of the Royal Society and the Royal Geographical Society (RGS), the new expedition carried out scientific research and geographical exploration in what was then largely an untouched continent. It launched the Antarctic careers of many who would become leading figures in the Heroic Age of Antarctic Exploration, including Robert Falcon Scott who led the expedition, Ernest Shackleton, Edward Wilson, Frank Wild, Tom Crean and William Lashly. Its scientific results covered extensive ground in biology, zoology, geology, meteorology and magnetism. The expedition discovered the existence of the only snow-free Antarctic valleys, which contain Antarctica's longest river. Further achievements included the discoveries of the Cape Crozier emperor penguin colony, King Edward VII Land, and the Polar Plateau (via the western mountains route) on which the South Pole is located. 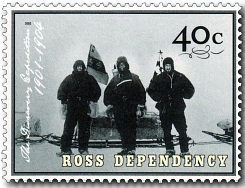 The expedition tried to reach the South Pole travelling as far as the Farthest South mark at a reported 82°17′S before being forced to turn back. 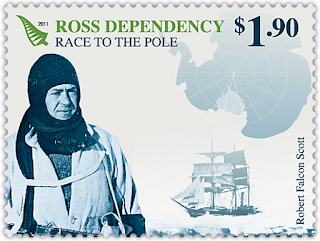 Captain Scott from the 2011 Ross Dependency stamp issue. On the list of the world's great explorers, Captain Robert Falcon Scott ranks high. His determination to be the first person to reach the South Pole, and his untimely and tragic death in the frozen wastes of Antarctica, made him a true hero of the British people. 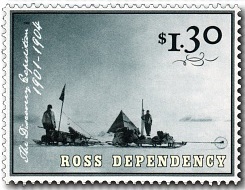 The Discovery Expedition was the first of Scott's attempts at the Pole. 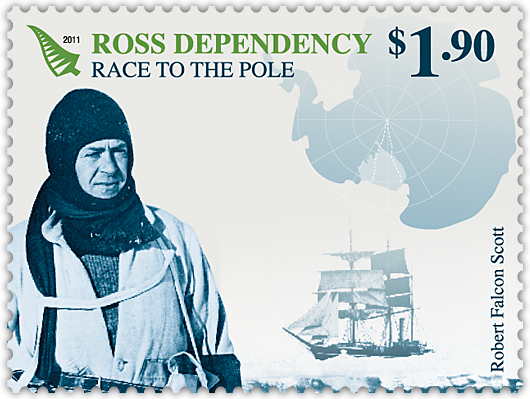 These six stamps marking the 100th anniversary of the Expedition, illustrate the stark reality of a journey that was to prove as arduous as it was exhilarating - a triumph of the human spirit. 40c - The Three Man Team. The 'British National Antarctic Expedition' began in 1896 as a determined goal for Royal Geographical Society President Sir Clements Markham. Five years and £50,000 later, it became a reality, 6 August 1901, the HMS Discovery and her crew of 47 scientists and sailors left Britain, commanded by naval officer Captain Robert Falcon Scott. 80c - HMS Discovery at anchor. 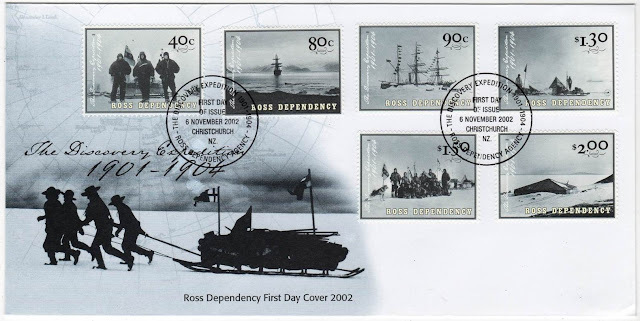 The HMS Discovery arrived in Antarctica in early 1902, approaching the continent by the Ross Sea and anchoring at McMurdo Sound. Built in Dundee and the first British ship to be specifically designed and built for scientific work, the HMS Discovery soon proved inadequate for her task despite her stout constitution, developing leaks and struggling in the heavy seas. 90c - HMS Discovery, frozen in icy terrain. 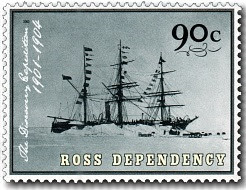 The HMS Discovery and her crew were to remain in Antarctica for the next two years, frozen in the grips of sea ice. 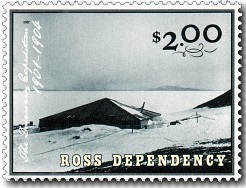 During this time, the research scientists made many discoveries and Scott explored to the east of the Ross ice shelf. He also made the first hot air balloon flight in Antarctica, rising 244 metres above its surface. $1.30 - Sledges and Tents. In the first summer, Scott and two companions - Edward Wilson and Ernest Shackleton - began their first significant journey south, accompanied by dogs and sledges. 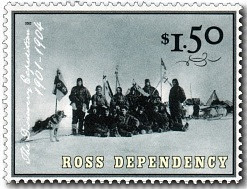 Not familiar with the terrain or managing the dogs, the men's dream of reaching the South Pole soon evaporated. Three months later a much-depleted team returned to the HMS Discovery, thwarted but undaunted. $1.50 - Crew of the HMS Discovery. 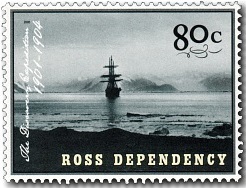 On 14 February 1904 the ice finally and dramatically released the HMS Discovery, and the expedition left McMurdo Sound five days later. They left behind the body of George Vince, a young sailor who had died in a severe snowstorm. A final emotional ceremony was held on the ice and a wooden cross was erected to mark his grave. $2.00 - Discovery Hut at Hut Point. Preferring to use the ship as his quarters, Scott built a base hut on shore, used mainly as a storehouse and cooking shed. The hut still stands today, stocked with many of the things the expedition left behind. Maintained by New Zealand and protected by the Antarctic Treaty, it is a testament to the courage and commitment of the men who built it. 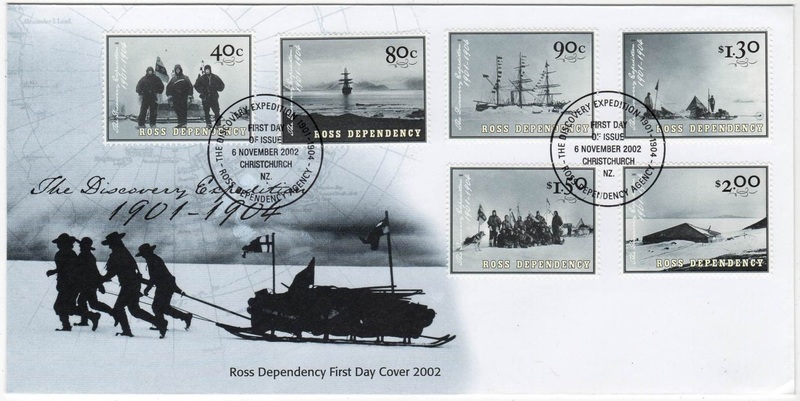 2002 Ross Dependency First Day Cover. The Spirit of Discovery. The 'Discovery Expedition 1901-1904' first day cover depicts the expedition as it is best remembered - a courageous and determined search for new territory and new scientific discoveries in a place where few men had ever set foot.